Is this New Zealand’s most postcard-perfect vista? 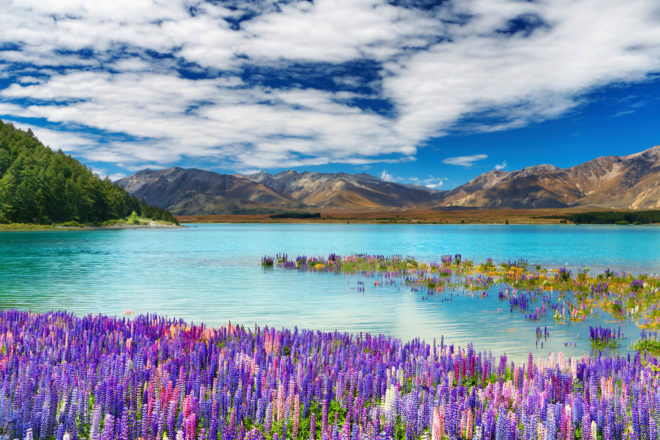 Lake Tekapo in NZ, where from mid-November to December each year, it's surrounded by a colourful blanket of lupins – a magnificent contrast to the turquoise waters. Welcome to the blindingly beautiful Lake Tekapo on New Zealand’s South Island. Our neighbour across the Tasman might be a favourite winter destination for snow-loving Australian travellers, but when the snow melts away and the flowers begin to bloom, we couldn’t think of a prettier place to be than right here. From around mid-November to December each year, the edges of Lake Tekapo, which lies in the heart of the Mackenzie region about three hours south-west of Christchurch, is cloaked in a colourful blanket of lupins – a magnificent colour contrast to the turquoise waters. And although, when coloured white, the pristine slopes are a nirvana for skiers and snowboarders, summertime turns this area into an aquatic playground perfect for swimming, boating, fishing and kayaking. Not to mention horse riding, trekking, mountain-bike riding and picnics with the breathtaking Southern Alps as your backdrop. If you stay after sunset – and we suggest you do – you will experience one of the clearest and most spectacular night skies in the world. Whether it’s day or night, winter or summer, Lake Tekapo definitely has us swooning. To book a stargazing tour atop Mt. John, visit earthandskynz.com.